Here is another stack worth making again! The delicate flavors of each ingredient made for a subtly sweet, light yet rich salad course. The dressing is particularly good. This is from the Stacks cookbook. It’s a smaller stack, which was perfect for a dinner party. You don’t want your courses to be too big when you’re having many of them. This stack can also be a light entrée when layered with diced grilled chicken or turkey. You can also substitute grilled pears, peaches or nectarines. When using pears, try almonds instead of walnuts. For peaches, use macadamia nuts. Prepare the dressing the day before, cover, and chill. Grill the apple slices early in the day; cover. Toast the walnuts the day before. Assemble the salad 1 to 2 hours before serving and chill. To prepare the apples, brush the apple slices with melted butter and dust one side with sugar. Grill the apples on both sides until golden and soft, about 5 minutes, or brown them under the broiler or on a stove top grill. Spray 6 stack cylinders (or soup cans) with vegetable spray and place them on a sheet pan. 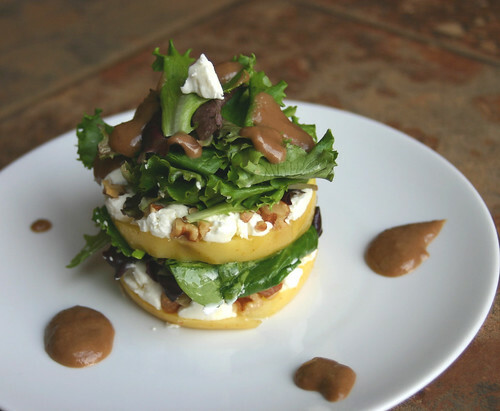 Layer in the following order: 1 grilled apple slice, 1 slice goat cheese crumbled in an even layer, ½ tablespoon walnuts, ¼ cup field greens or baby lettuces. Repeat the layers, ending with the greens. Press down gently but firmly and chill until serving time, at least 1 hour. To serve, slide spatula under each stack cylinder and transfer to a serving plate. Unmold, spoon dressing around the base, drizzle a small amount of dressing over the top of the stack, and serve. To toast walnuts, place 2 cups in a small, shallow baking pan and spread in an even layer. Bake in a 350 degree oven for about 8 minutes, or until the nuts are golden brown. Remove and cool. Can be frozen in resealable plastic bags. Place the mustard, grilled apple, and vinegar in a food processor and blend until smooth. Slowly add the oils and blend until thickened. Chill. hey, if any of you gals are readers, i started something new where you cook from the books, called food for thought. check out my sidebar here and see if its something you might want to do, you are so creative in the kitchen and with your camera’s love to SEE what you are reading! This salad looks very elegant! Loved how assembled the apples and greens. wow what a stack! have to say, the dressing sounds heavenly! As always super crisp , vivid photo. This looks just delicious, Katy! Another wonderful creation from your famous dinner parties! What a pretty presentation. What a terrific salad course for a dinner party! Presentation is half of the fun when we eat, and this salad is a perfect example. Lovely presentation, and you are right, an elegant start to a dinner party. Thanks for all of the great reviews! That Stacks cookbook has been an inspiration. When you start with stacking food, it’s much easier than it looks. I encourage you all to give it a try if you haven’t already. Love your stacks, and this one is no exception! Stunning pic. Wow!!! What a photo and a great recipe too…. great post! This looks great. Is it difficult to eat without making a mess? Just cut it with a knife. Unlike the taller stacks, this one doesn’t have the tendency to fall when you cut into it. The most difficult thing to do is to get your guests to cut into it and start eating. They’re always gawking at its beauty and not wanting to ruin the art of it all. Sometimes you have to plan the next course about 5 minutes later for the admiration of the stacked goods. Once someone tastes it, though, all gawking is over, and they dig right in. How did I mis this? Gorgeouos- have never done “stacks” and now I see how they are so popular. This is certainly a pretty taste-treat. I love stacks of any kind of food! This was a beautiful side dish at a dinner party I had recently, so thank you for the great idea. It was a hit and tasted great too! And thank YOU for letting us know. I’ll forward along to Katy. So glad you tried and enjoyed it!